Wow, who would have thought that five months could pass by without finding the time to write a blog post?! That's a little embarrassing. 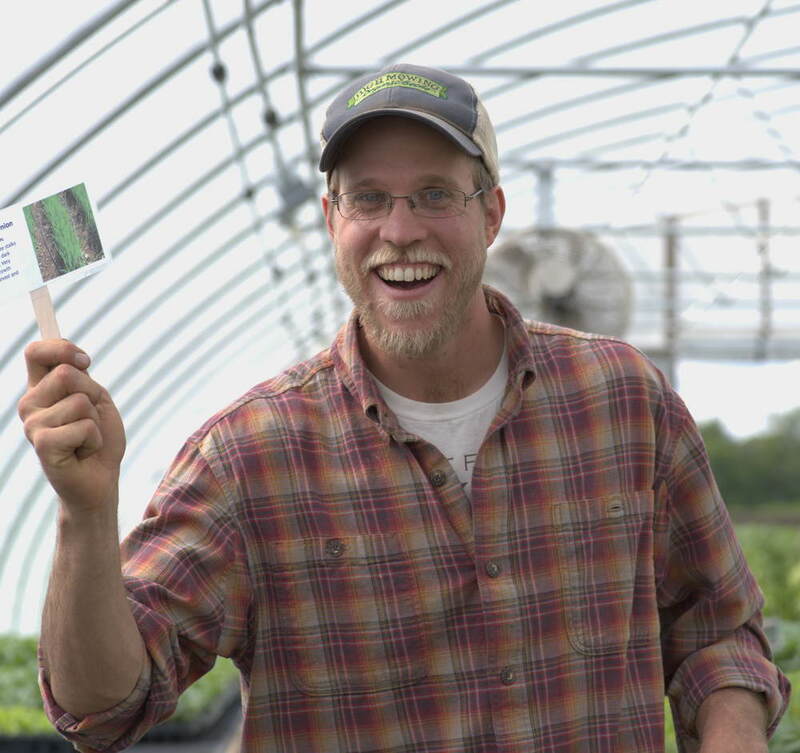 Something happens in June on a vegetable farm: after a winter of planning and a spring of planting, harvest begins. And not only that, farmers' markets start up, CSA pack commences, weeds emerge, and the rest is history. At least that's how I felt during my first growing season as a Sogn Valley farmer. But despite the craziness of the last five months, I'm happy to say that it was a fairly successful season. That doesn't mean that everything went according to plan--early season wind storms caused damage to buildings and crops; diseases caused serious losses in our melon, cabbage, broccoli, and pepper crops; and we had unexpected expenses arise, such as replacement of the transmission in our delivery truck after it went kaput during a delivery in June. But, thankfully, much more went right this season. First, we fared pretty well in terms of weather. The degree to which farmers' fate is in the hands of Mother Nature is unquestionable. We live on a pretty hospitable planet, but weather patterns are becoming increasingly volatile due to climate change. We had some periods of prolonged moisture that likely contributed to disease spread in our field, but we were spared the 5-inch rains, hail, and other devastating weather events. Second, the crop mix and planting sizes worked out fairly well for the needs of our CSA and farmers' markets. This is a challenging aspect of starting a vegetable farm on land you haven't farmed and for markets you've yet to serve. With so much crop diversity and so many succession plantings (some crops, such as broccoli, cilantro, and lettuce, are planted roughly every two weeks throughout the season), it's not an easy task matching production to market needs. We have plenty of notes to guide us in tweaking our crop plan next season to produce more or less of a particular crop, or to have it ready to harvest earlier, later, or more consistently throughout the season. 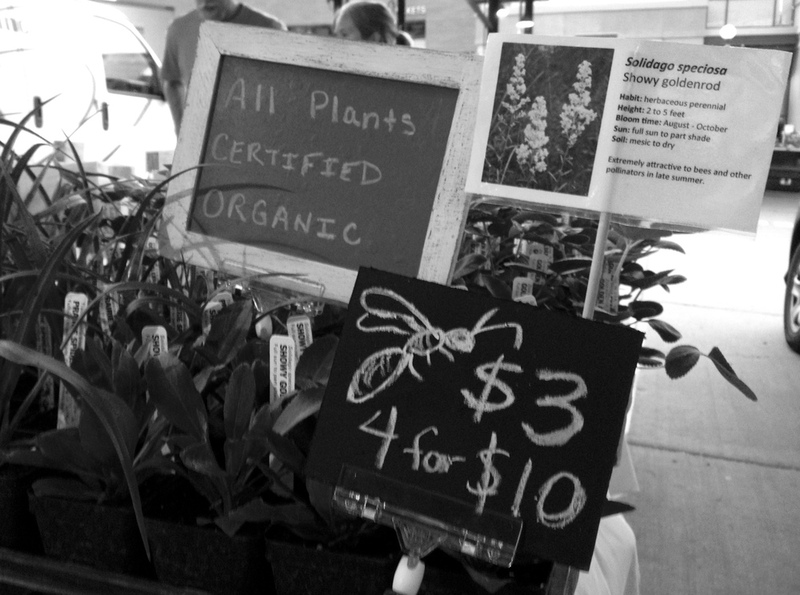 Third, we met or exceeded our sales goals for our three types of markets: CSA, wholesale, and farmers' markets. The farmers' market was particularly unknown - would there be too much competition with the many other vegetable vendors? 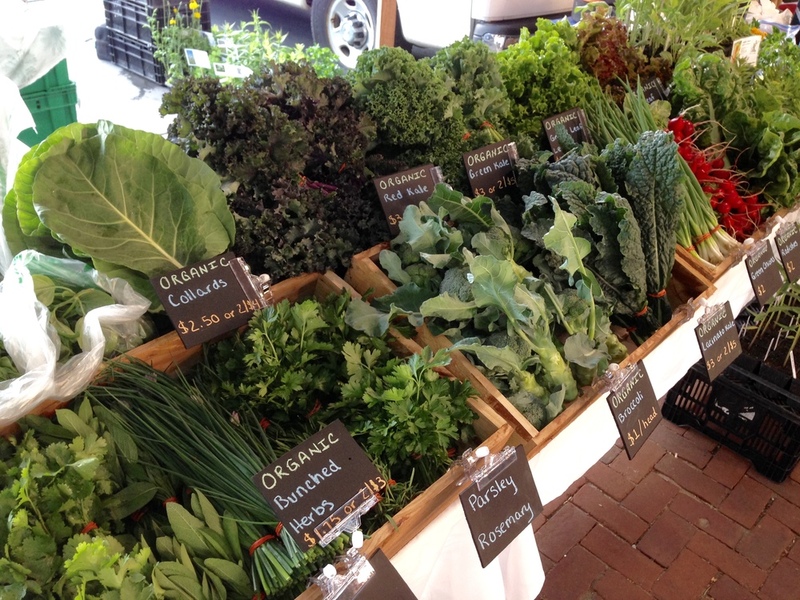 Would market-goers seek out organic, and be willing to pay the extra cost? We were amazed, and humbled, by how much our customers appreciated us being there, particularly because we were certified organic. 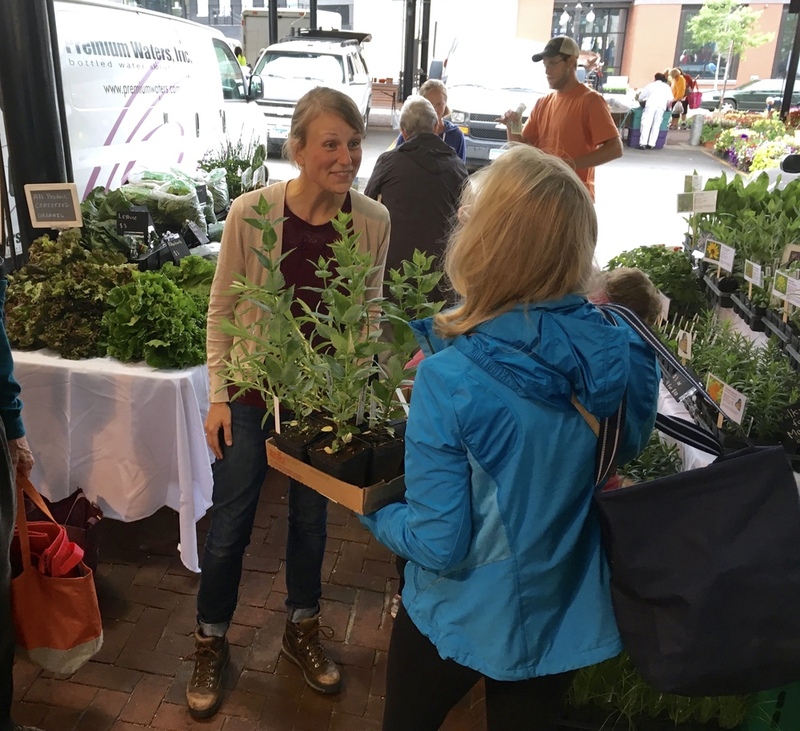 We heard time and time again that people have been coming to the St. Paul Farmers' Market for years and have never been able to find enough organic produce. One woman even said that she and her friends had been driving to Minneapolis every weekend to find organic produce at the Mill City market, but now she no longer had to! Quite quickly, we developed a very loyal customer base that came by to support us week-after-week, and for that we are incredibly thankful. So here we are in the final weeks of 2016 and the waning days of our first growing season. While we will attend at least a couple of winter farmers' markets in December, we have mostly wrapped up the "farming" for the season. But the to-do list remains long (surprised?). It's finally time to get around to some long-delayed infrastructure projects (on the employee cabins, the packing shed, and the greenhouse), wood cutting and splitting for winter heating, and a big back log of computer work, including entering and analyzing harvest and farmers' market sales data to guide 2017 decisions, creating education resources for our website, and tidying up our books ahead of the upcoming tax season. Karin is also now busy cleaning native seeds (removing chaff and other debris that comes with hand-harvested seed), which she will then subject to stratification (storage at a particular temperature and moisture level for a particular length of time) before we start seeding in the greenhouse in February. Allow me to introduce myself. 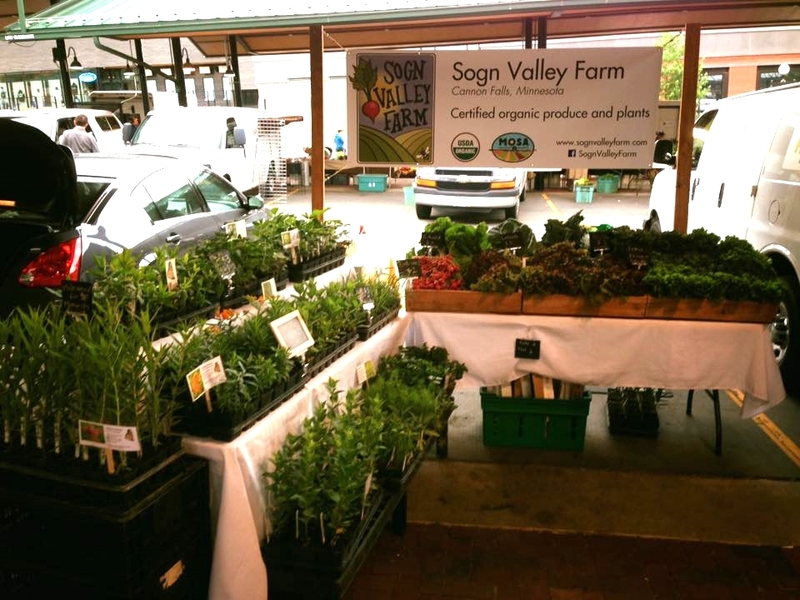 I’m Karin, Dana’s wife, and I represent the “other half” of Sogn Valley Farm. You haven’t heard much from me yet, though I show up occasionally in photos. I’m introverted, and I prefer to labor quietly behind the scenes rather than take center stage. Still, I think a little background about myself and my “half” of the business would be more than timely right now! I am a conservation biologist by training, and I have a fascination with all things related to plant-pollinator relationships. I do this type of work for a living off the farm, but I’m interested in plant-insect interactions on our farm, as well. In particular, I have a great affection for bees, in no small part because they are critical for sustainable food production. Animals (bees, beetles, butterflies, birds, and bats) are responsible for bringing us one in three bites of food each day. These critters are not an optional part of our food system; they are essential! Not surprisingly, the natural ecosystems that surround agricultural and urban landscapes also depend on bees – and bees depend on them. In our part of the state (Goodhue County, and the edge of the Driftless Region), the original vegetation type prior to settlement was tallgrass prairie and oak savanna. Now, less than one percent remains of the prairie grasslands that once blanketed North America. 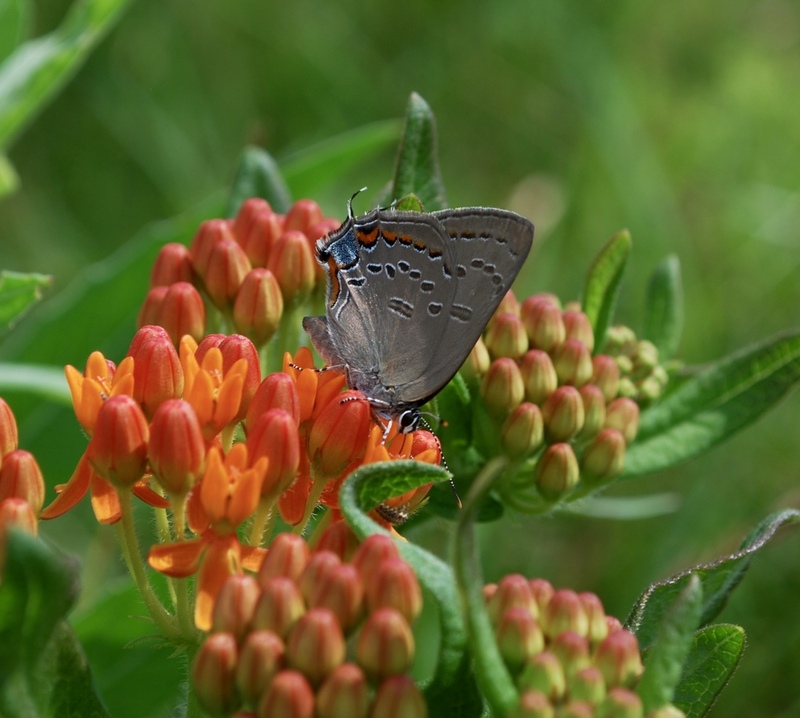 As the remaining prairie becomes increasingly smaller and fragmented, we’re starting to see the decline of once-common Minnesota pollinators like the Poweshiek skipperling and the Rusty-patched bumblebee. It is estimated that there are over 4,000 different bee species in North America, and we think there are over 400 bee species in Minnesota. Very little is known about our Minnesota bee residents, and we’ll miss our chance to learn about them if we lose what’s left of our native prairie in Minnesota. And this is where my half of the business comes in. Though a reluctant businesswoman, I am passionate about prairie restoration and pollinator conservation, so I’ve made good use of our greenhouse this winter by growing prairie plants to augment habitat around our own farm (we want to attract pollinators to improve our crop yield! ), as well as for sale to regional gardeners, landscapers, and restoration practitioners. Many of the seeds I used were collected from remnant upland and wetland prairie on the Jokela farm and from other remnant Minnesota prairies. We now have thousands of potted plants available, and we’re hoping you will help disperse them throughout the region after our on-farm Plant Sale and Open House this Saturday, May 14th. Prairie spiderwort (Tradescantia bracteata) ready to be planted in a garden near you! 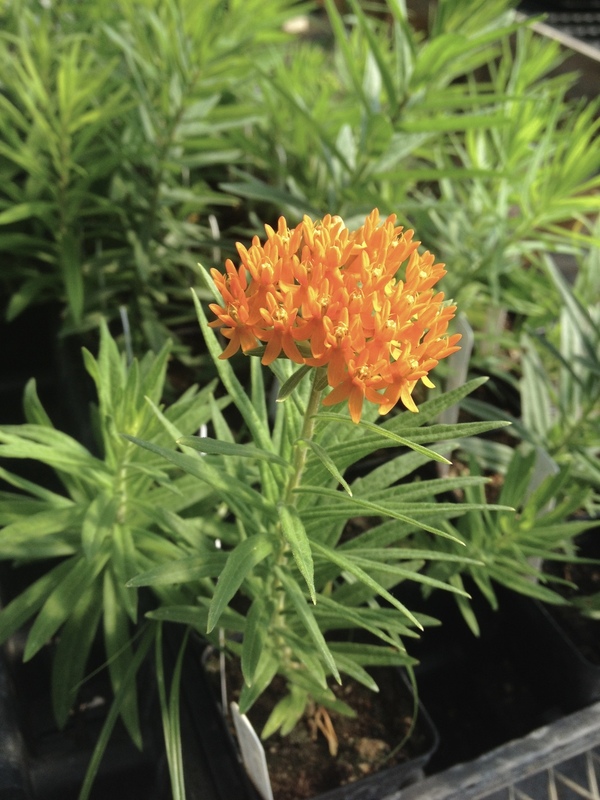 Are you new to gardening with native plants? And, what is a native plant anyway? To avoid confusion and/or intimidation, I’ve created a brief summary of what native plants are, and what they are not. - grew in communities and ecosystems of our region before European settlement (i.e. naturally occurring prior to human actions). - co-evolved with regional animals, soil microbes, and fungi (both beneficial and harmful). - provide habitat (food and shelter) for a great diversity of wildlife. - attract visitors like butterflies, hummingbirds, and bumble bees. - are often deep-rooted – sometimes reaching down 15+ feet. - are well-adapted to our local light and temperature conditions, droughts, floods, and other extremes of Minnesota climate. - are low-maintenance garden perennials once established. - sometimes produce very showy flowers (but not always). - create healthy environments for humans and animals. - don’t need to be mowed! - require less water and fertilizer than cultivated plants. - remind and teach us about our natural heritage. - are local and beautiful! - for human consumption (with some exceptions). - meant to grow in hanging baskets or containers throughout the growing season. - guaranteed to bloom in the first year after planting. - necessarily “messy” or “wild”; they can be incorporated into a well-designed garden. - always fragrant (as many cultivated varieties are). - genetically modified or bred for showy, multicolored flowers. They provide the foundation of our ecosystems and offer services such as crop pollination, clean air and water, aesthetic enjoyment, and recreation opportunities. Native plants are easy to maintain, too! They require less water and fertilizer. And, importantly, they are beautiful! Try incorporating some into your perennial garden this year, and let us know how it goes! We hope to see you one way or another next weekend – whether it’s to shop for native plants, vegetable starts, or just to catch a glimpse of spring madness on a young farm. All are welcome! 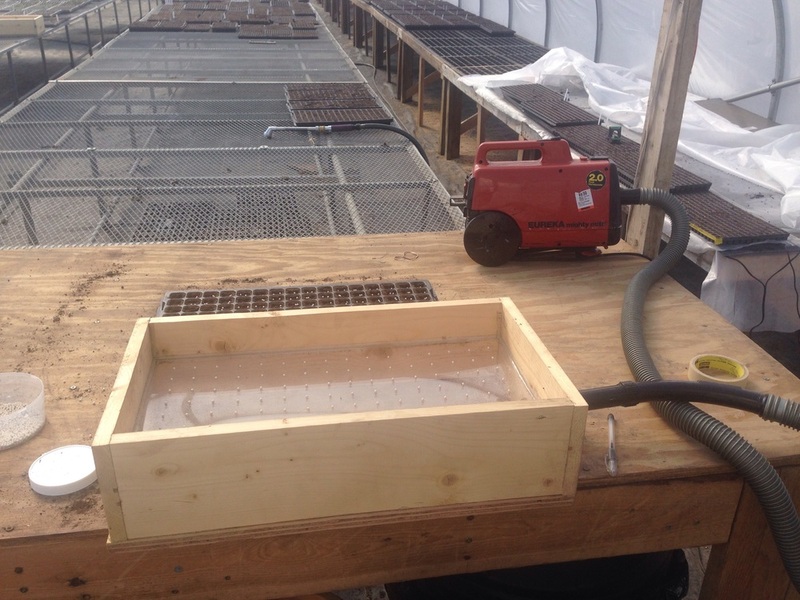 It has now been over two months since we fired up the greenhouse to begin growing vegetable transplants and prairie plants, and nearly a month since our first field planting. On the whole, things are looking great. 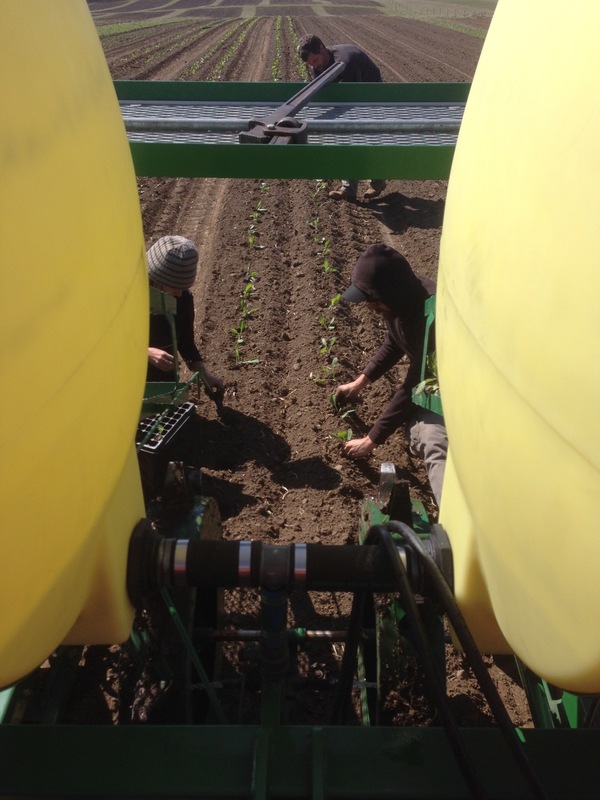 A warm late-March allowed the ground to thaw and soil to dry out by early April, so we took advantage and seeded peas and spinach—two of the hardiest vegetable crops—during the first week of April. But then we didn’t get a drop of rain for another two weeks (hindering germination of said peas and spinach), and it turned cold after that. So we won’t be ending up with those super early harvests we had been hoping for. 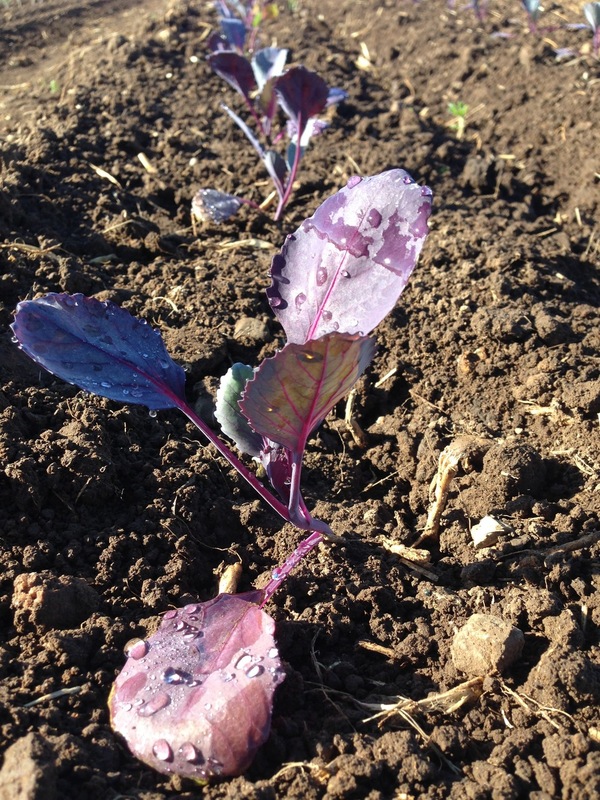 But that uncommonly long dry stretch in April did allow us to transplant some longer season crops, such as onions and brassicas (broccoli, cabbage, kale, etc.). There were no issues with water for these transplanted crops, as they are provided water during transplanting. We also now have our irrigation system in place that allows us water crops using drip irrigation, a system which slowly and efficiently delivers water through finely perforated water tubes buried in the soil. We are now a week away from the first planting of warm season crops like tomatoes, peppers, basil, and cucurbits (cucumbers, melons, squash). 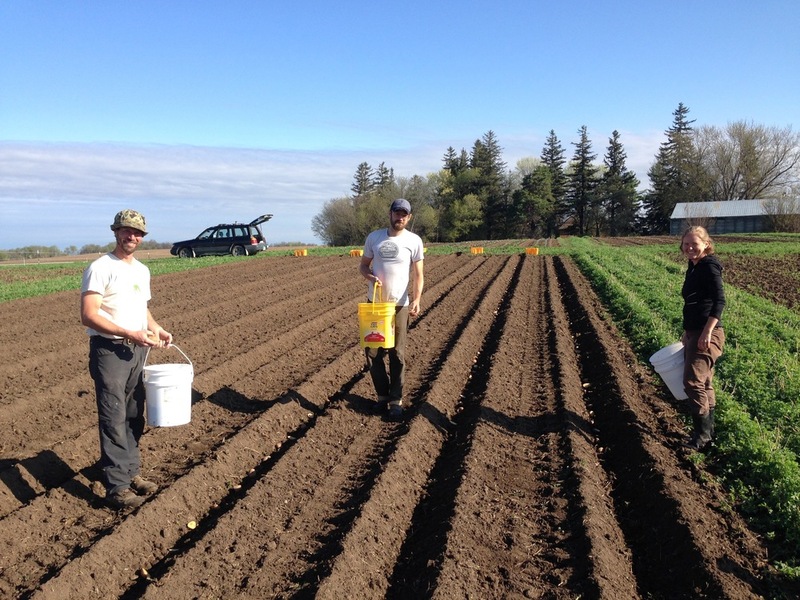 That marks a turning point in the season when things get a lot busier, because in addition to planting, we are now also into cultivating and hoeing all the weeds that grow on this rich prairie soil. In my experience, soils that grow the best veggies also grow the best weeds. 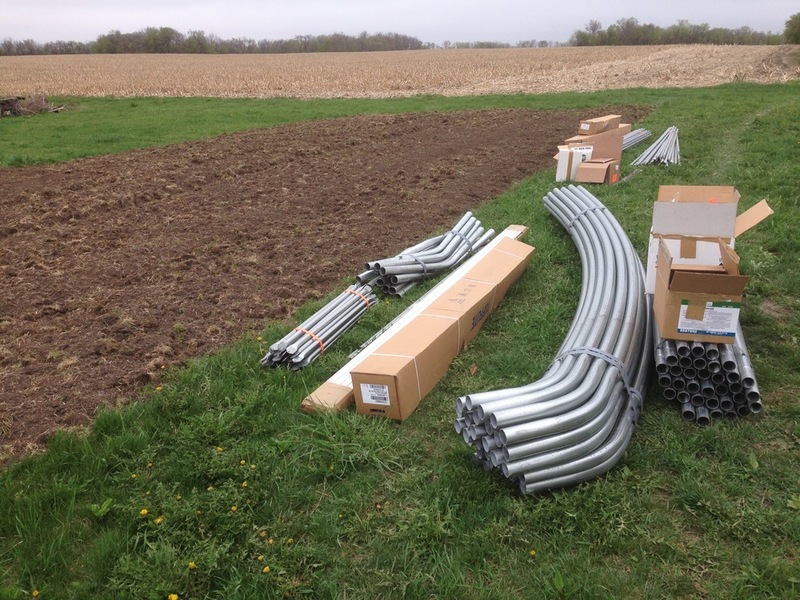 Alongside all the normal growing season fieldwork thus far, we’ve also been busy with some infrastructure projects. We have been finishing renovations on a building we are converting to our packing shed. This is a very important facility for vegetable production, as it’s where all the vegetables go right after harvest. Our ability to rapidly cool down produce and then store it at the proper temperature ensures the greatest nutrition and shelf life. This is also where we wash our crops and pack boxes for delivery. 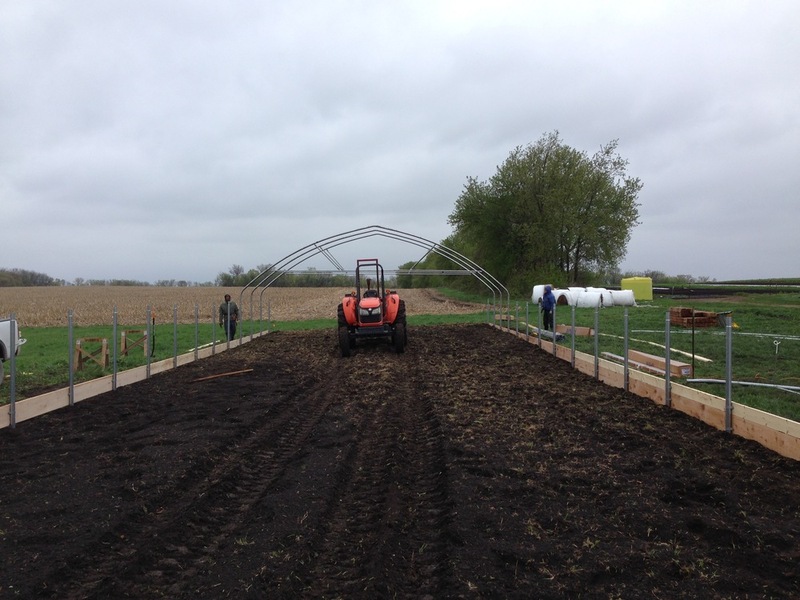 The second project was construction of a deer fence around our entire vegetable production field. Our farm is about half cropland and half grassland and forest, and deer really thrive with that combination of habitats. We learned that quickly when some spinach we seeded last fall was quickly grazed down by deer. The particular fence we built is a “3-D” electric fence. It’s essentially two electric fences running parallel to one another, about 3 feet apart. The fences are not tall enough to prevent a deer from jumping over them, but the depth effect of having two parallel fences takes advantage of the deer’s poor depth perception. Since they can’t easily tell how far they’d have to jump to get over, and they are risk averse by nature, they choose not to try jumping over. That’s the theory at least, and we sure hope it works! It’s been two weeks since we transplanted our first round of lettuce, which is candy for deer, and so far no grazing. 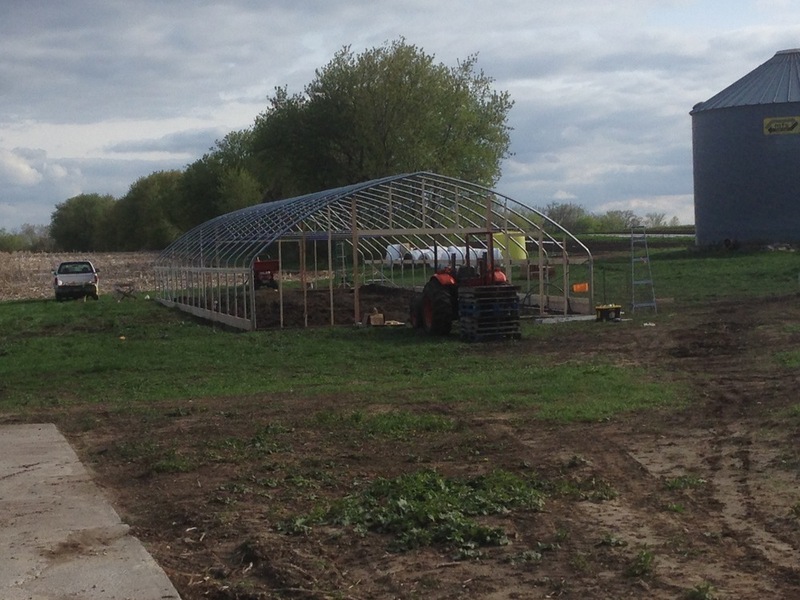 The last project, which we finished up today, is construction of a 30’ x 96’ high tunnel. 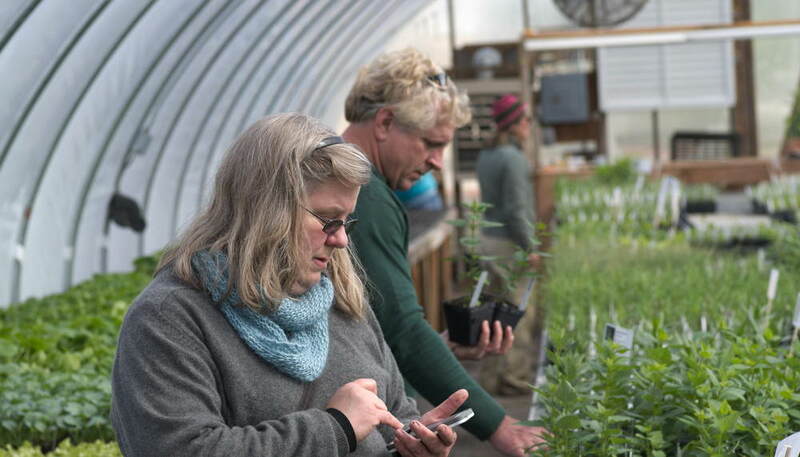 A high tunnel is essentially an unheated greenhouse used for season extension and climate modification for crops grown in the soil (as opposed in containers on benches in a greenhouse). Tomatoes grow very well in high tunnels, as they appreciate the added warmth (particularly in the spring and fall), but also because the plastic film that covers the greenhouse excludes rain, keeping the foliage dry most of the time. 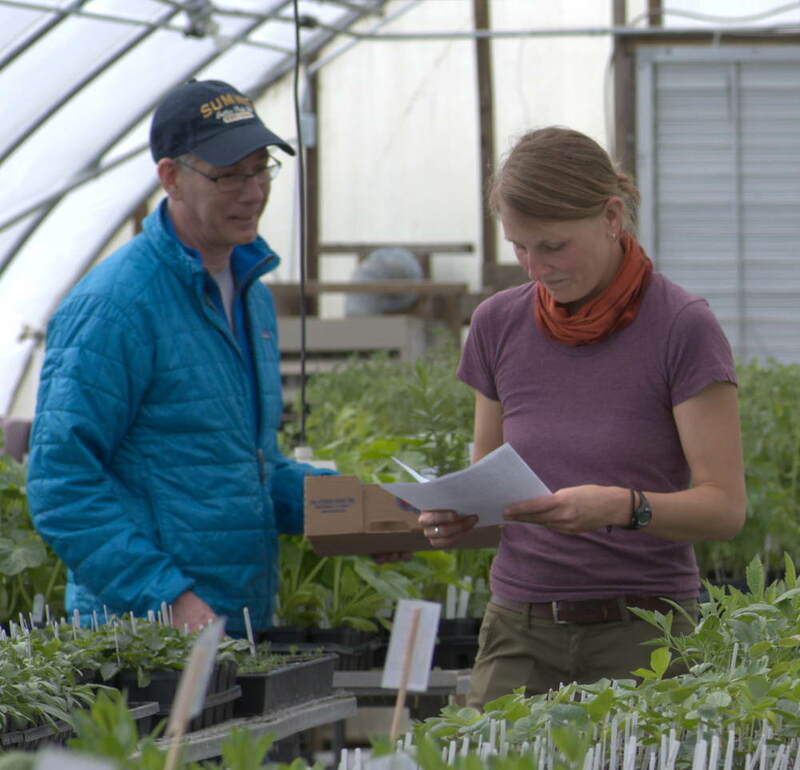 Since many plant pathogens require moisture on the leaves to infect and cause disease, high tunnels are a great way reduce disease and increase quality of tomatoes. We provide 100% of the water the plants need using drip irrigation. We're looking forward to having these building projects behind us so we can focus on growing PRODUCE! Beginning two years ago, we have been cleaning up the Jokela farm and preparing it for it's new chapter as Sogn Valley Farm. While we have rounded up and thrown away a substantial amount of stuff from the farm's outbuildings (with the occasional exasperated, "argh...did grandpa throw anything away? "), we also feel so lucky to have use of facilities that Dana's grandparents, Veikko and Phyllis Jokela, built during the 50 years they lived on the farm. One building, in particular, has been the subject of rapid change recently. Last year, we cycled through many ideas for ways to create a packing shed on the farm without having to just build one from scratch. The packing shed is a very important part of a vegetable farm - it's where the produce is cooled, stored, washed, and packed for delivery. Proper post-harvest handling ensures maximum nutrition and quality of our produce, and is central to our food safety program. Over the summer, we settled on a building formerly referred to as the "loafing shed." This is where the beef cattle were overwintered during the first few decades Phyllis and Veik farmed here. It was about the right size for our pack shed, but was basically not much more than a roof and three walls. It was filled with an assortment of items--unused equipment, retired grain bin augers, spare tractor tires, and more. So we set to cleaning it out. The soon-to-be packing shed after clearing out all the equipment and part-way through excavating out the old fill. Next, we had two important services supplied to the building: electricity and water! Now we would be able to wash produce and store it in a walk-in cooler. Electric cable laying in a trench. Electrical panel and frost-free hydrant installed! The earthen floor in the building wasn't ideal for our purposes. We wanted something that we could move pallets around on, easily sweep and wash, and which would be able to drain away wash water. In other words, concrete! We decided to insulate the slab and run plastic water pipes through it to allow for heating the floor. Stapling the Pex tubing down to the insulation with the help of our friend Bryn Takle. In the future, we will heat the concrete slab by boiling water using a wood furnace and circulating the water through this tubing. Concrete pouring! This part we hired out. Many thanks to O'Gorman Masonry for doing a bang-up job. The finished product during the curing process. That was last fall. Fast forward to last week - when we wired in lights, enclosed the south side of the building with steel siding, installed a garage door, and built a walk-in cooler inside the building - and it's starting to feel more like a packing shed. Our first employee, Karl Sames, putting up the siding. Cooler panels are unloaded and ready to be put together. Thanks to Brandon Carpenter for again coming up from Iowa to help us with projects! The cooler has two rooms, and we'll use one for crops that are best stored cold (just above 32 degrees) and the other for crops that like it more moderate (45-55 degrees). Cooler is built and refrigeration equipment ready to be installed (by a professional). Overhead door is done and entry door frame in place. Next steps are to install the entry door and finish up the siding. This farm is changing. For us, it's exciting - the fruition of a long-held dream. But we can't help but acknowledge the legacy of this farm and give thanks to Phyllis and Veikko for their decades of investment - monetary and labor - to build up this farm. If they were still alive to see the changes, I expect Phyllis would smile and Veikko...well, he might say something like, [long silence] "yup, it looks fine." And coming from Veikko, that's a compliment. Vacuum flat seeder - a real time saver! I am drilling holes through a piece of thick plexiglass mounted at the midpoint inside a rectangular wooden frame. These holes are sized for a particular type of seed, and arranged in the same spacing as the cells in a plug flat, which we use to produce vegetable transplants. 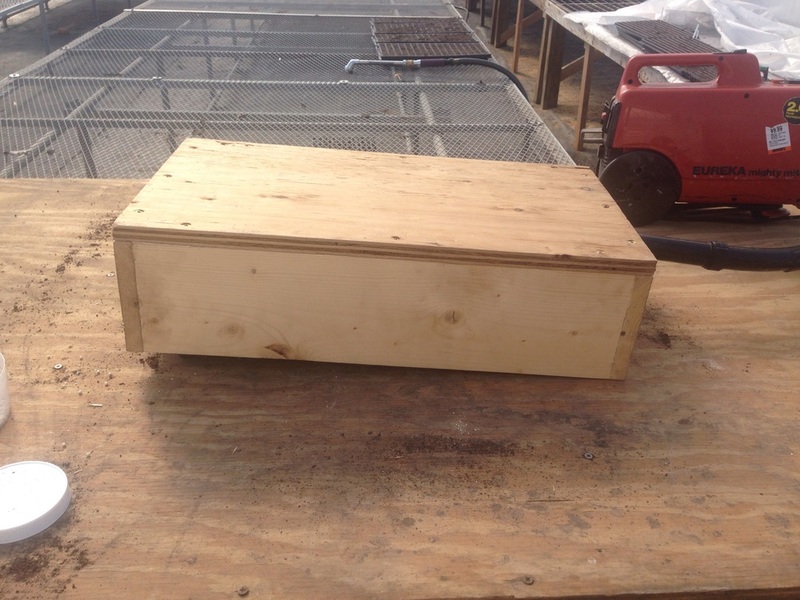 Next, I attached a piece of plywood to seal off the bottom, creating a chamber underneath the plexiglass. After drilling a circular hole in the side of that chamber, I'm able to connect it to a vacuum cleaner and apply vacuum inside that chamber, resulting in suction on each of those holes drilled in the plexiglass. So here's how it works: turn on the vacuum cleaner, pour a bunch of seeds onto the surface of the plexiglass, and swirl it around so the seeds slide all over. 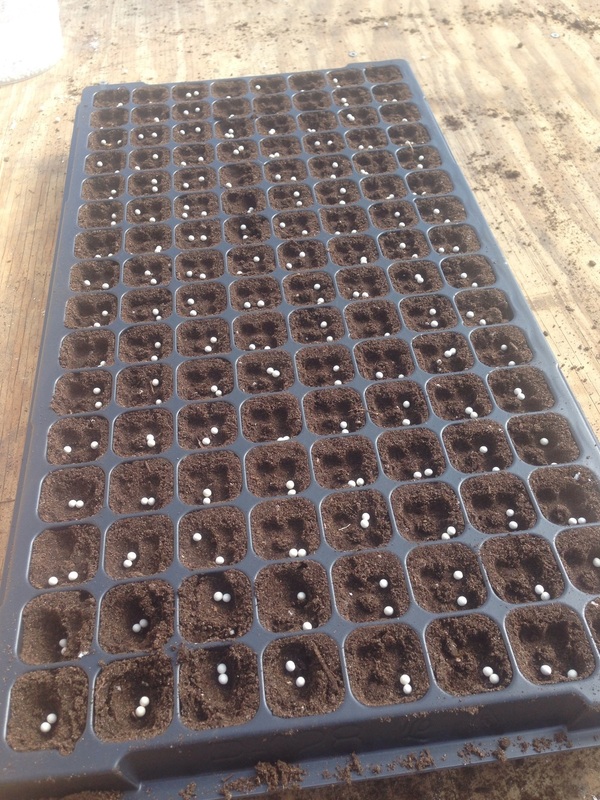 Each one of the holes will grab a single seed. Then, with the vacuum still on, pour off the excess seed into a container, and flip the box over onto an unseeded flat with dibbles (the technical term-honestly-for depressions in the potting mix to hold a seed) made in each cell. Then turn off the vacuum and the seeds will fall out, one in each cell of the flat. Here are a few photos of the process. In this case, I'm using pelleted onion seeds, meaning the seeds are embedded in a clay coating, forming little BBs. This makes them easier to handle and more uniform. We plant onions in clusters of 2 to 4 plants, depending on the variety. Vacuum applied, one seed stuck to each hole. The vacuum seeder in front, and the flat waiting to be seeded behind. This flat already has two seeds in each cell. The seeder is turned over onto the flat. Vacuum is then turned off, and the seeds drop. Ta da! Now there are three seeds in each cell. We have a separate seeder to use with smaller seeds, like broccoli, cabbage, and kale seeds. This tool doesn't work as well with irregularly shaped seeds, such as pepper or tomato seeds, since they're more likely to have multiple seeds get stuck to each hole. But we are happy to use any tool that make tedious tasks, like seeding flats, a little bit faster.